My kit is out of production. It has a copyright date of 1976. However, there is one on Amazon for $18.46. A one on 3 places on eBay for $7.95, $13.95 or $20.00. I paid $3.98 back in the 70's for mine at a local hobby shop that went out of business. The Focke-Wulf Fw 190 Würger (English: Shrike) is a German single-seat, single-engine fighter aircraft designed by Kurt Tank in the late 1930s and widely used during World War II. Along with its well-known counterpart, the Messerschmitt Bf 109, the Focke-Wulf 190 Würger became the backbone of the Luftwaffe's Jagdwaffe (Fighter Force). The Fw 190A started flying operationally over France in August 1941, and quickly proved superior in all but turn radius to the Royal Air Force's main front-line fighter, the Spitfire Mk. V,especially at low and medium altitudes. The 190 maintained superiority over Allied fighters until the introduction of the improved Spitfire Mk. IX. In November/December 1942, the Fw 190 made its air combat debut on the Eastern Front, finding much success in fighter wings and specialised ground attack units called Schlachtgeschwader (Battle Wings or Strike Wings) from October 1943 onwards. The Fw 190 provided greater firepower than the Bf 109, and at low to medium altitude, superior manoeuvrability, in the opinion of German pilots who flew both fighters. The Fw 190A series' performance decreased at high altitudes (usually 6,000 m (20,000 ft) and above), which reduced its effectiveness as a high-altitude interceptor. From the Fw 190's inception, there had been ongoing efforts to address this with a turbosupercharged BMW 801 in the B model, the much longer-nosed C model with efforts to also turbocharge its chosen Daimler-Benz DB 603 inverted V12 powerplant, and the similarly long-nosed D model with the Junkers Jumo 213. Problems with the turbocharger installations on the -B and -C subtypes meant only the D model would see service, entering service in September 1944. While these "long nose" versions gave the Germans parity with Allied opponents, they arrived far too late in the war to have any real effect. Otaki was a model company based in Japan. I believe they went out of business. 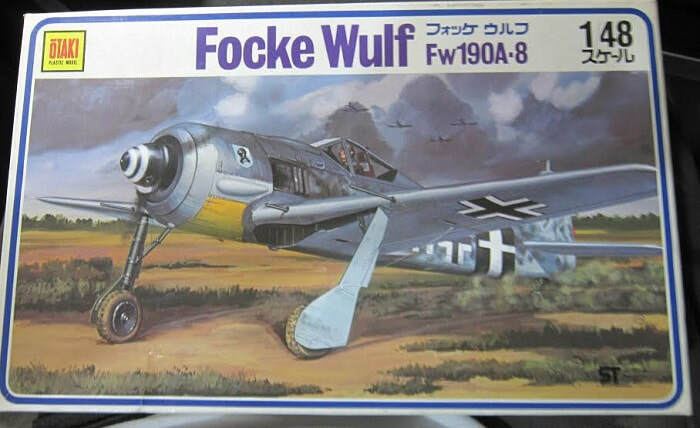 The box art shows a Fw-190A-8 taking off from a grassy field under stormy looking clouds. Three more Fw-190's are over-flying the field in V formation. The one taking off is dark-green above a light-blue undercarraige, with a gray upper cowling front and white lower cowling front. It has a dark green mottling on the sides of the fuselage, black and white spiral on the spinner and yellow under the nose. Fuselage code is white 11 + - and a blue shield with a knight's head on it on the sides of the nose. This aircraft is with IV/JGA. The horizontal bar behind the fuselage cross is on top of a black, white, black fuselage band. 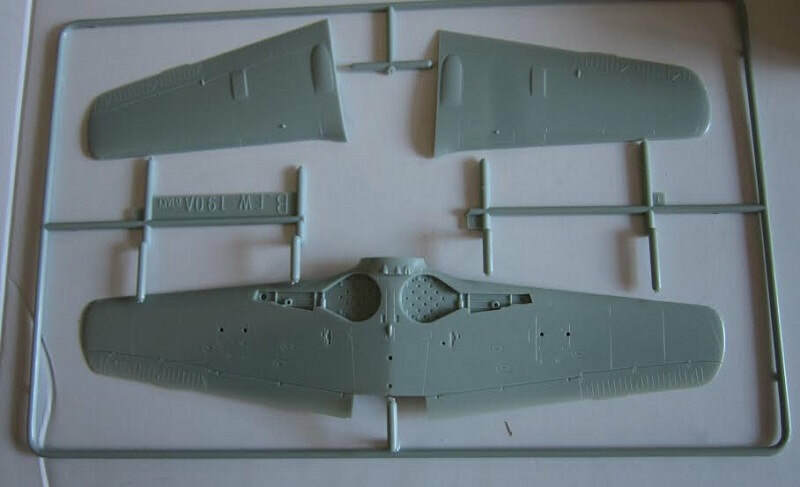 One side panel shows 2 side profiles of Fw-190's. One has a dark-gray spine, light-blue sides with green mottling and a light-blue undercarraige. A black and white spiral on the spinner, the fuselage code black 4 + - with the black bar over a white fuselage band. It is with VIII/JG 300. 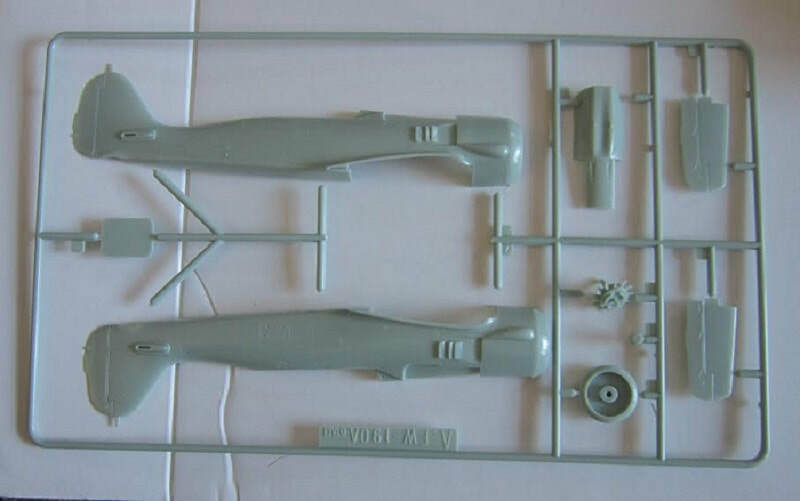 The other Fw-190 has a dark-green spine and mottle on the sides over light-blue that is also on the undercarraige. The fuselage code is red 13 + and a squggle outlined in white. The black engine exhaust ramp has been extended into an eagle's head (like the Squadron Shop's logo). 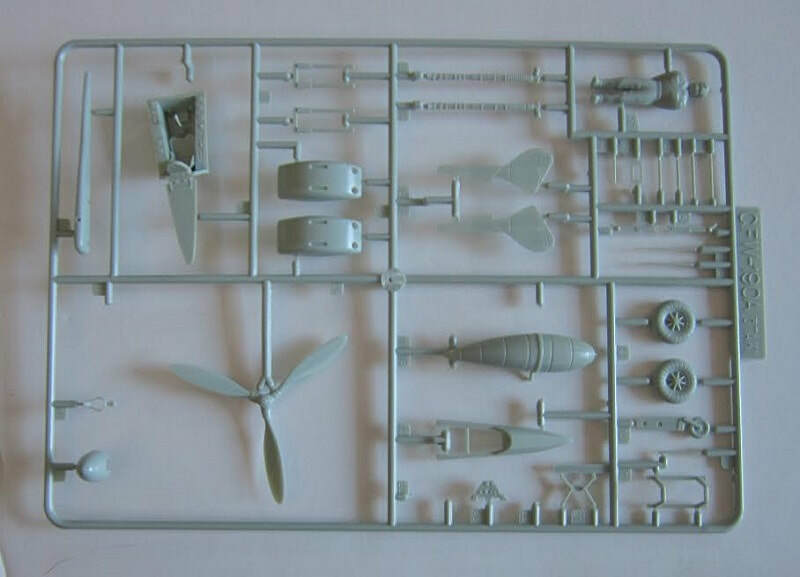 The other side panel has 5 box arts of other 1/48th scale aircraft kits that Otaki manufactured: a Spitfire Mk.8, a Bf-109G-6, a Fw-190A-8 (this kit), a P-40 Warhawk and a P-51 Mustang. No kit numbers for these 5 is shown. This kit contains 3 medium-gray trees, a clear tree and decal sheet in 2 sealed cello bags and 2 instruction sheets. One instruction sheet is folded in the center to create 4 pages in 7 1/2" x 11" page format. Page 1 is the parts trees illustrations. Page 2 shows side profiles of 3 schemes (already described above). Pages 3 & 4 give a grand total of 11 assembly steps. The second instruction sheet is printed in color on slick-coated stock on one side and is the same size as the first instructions. It shows 2 side profiles of the 2 Fw's with fuselage codes 13 and 4 (already described above). Trees are alphabetized, illustrated in the instructions and have part number tabs next to the parts on them. ​Medium-gray letter C tree holds: a standing figure, main wheels, tail wheel, drop tank (I already assembled), propeller, wheel pants, gun blisters, landing gear legs, cockpit tub and seat (I already assembled these too). ​The clear tree is letter D. It holds 2 canopy parts. There is no seated pilot figure, only the standing crewman. Nicely engraved detail. 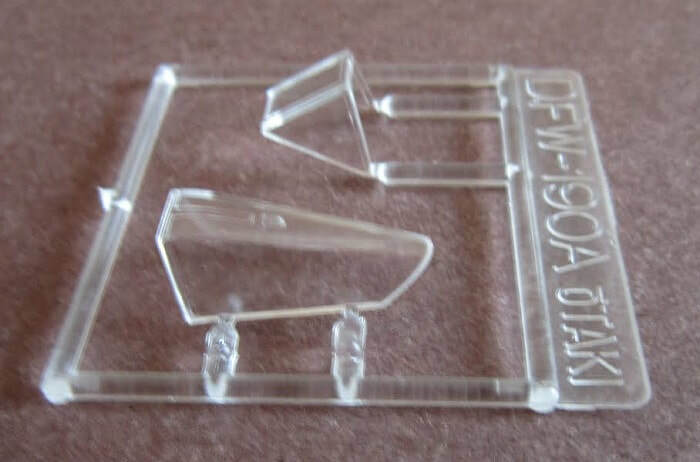 Flaps are all molded solid.